In our marketing profession, what is truly better than that satisfying moment when the light bulb goes on and the solution we’ve been searching for is suddenly revealed—and then surpassed in brilliance by the light of strategic creativity? It’s called an “Aha!” moment and as marketers, it’s what we live for! Here are five prime examples of “Marketing Aha!” moments so big and so bold that they altered the way we market brands and launched companies into marketing history. Pure genius! Aha Moment: Often the prerequisite for creating a truly memorable campaign is for marketers to frame and link a brand’s features in a new way. 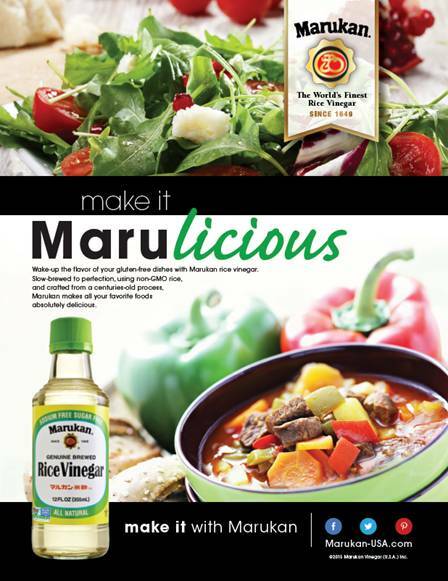 The simply brilliant move for this 365-year-old company (yes, it really has been around that long) was to break out from the competitive clutter in all communications linking the usage of the brand, Marukan, with the end-result benefit of making your meals even better tasting. Marukan…delicious…Marulicious. This promotion made the most of timing and brand image to boost consumption and share, thus keeping Orville Redenbacher’s the leading name in the snack category. 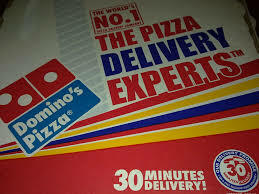 Aha Moment: Although “marketing integration” is commonplace in 2015, think back to the early 1980’s when the Orville Redenbacher’s popping corn brand broke the barriers of interdependent consumer communications by combining multiple distinct media together for the first time to create an involving event. 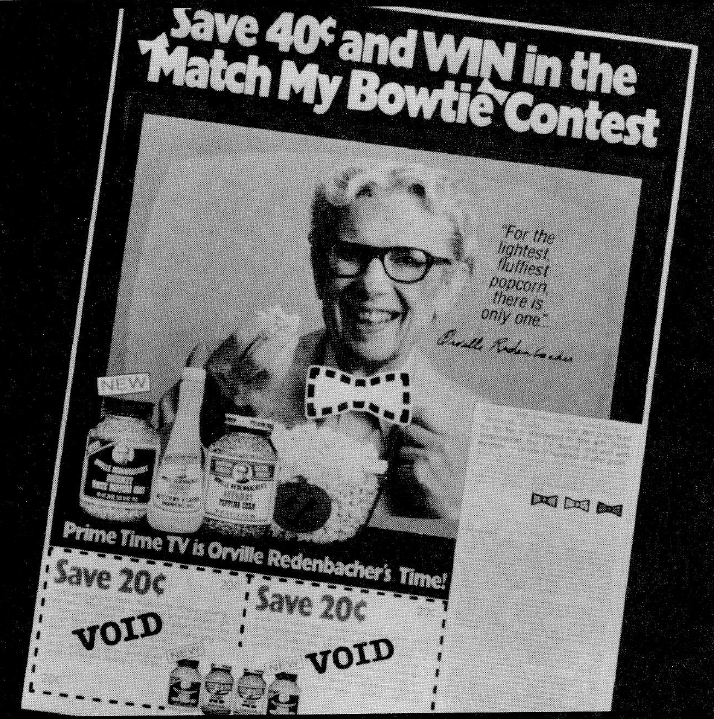 The campaign featured a photo of the brand icon, Orvillle Redenbacher himself, in national magazines, freestanding inserts and retail merchandising materials with the color/pattern missing from his trademark bowtie. Consumers were instructed to look for the new television commercial during specific fall season TV shows debuting that week to spot the color/pattern of Orville’s tie to enter a contest. Consumers loved it! 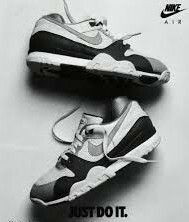 Awareness of the commercial rose to an all-time high, sales increases popped to the brand’s highest levels ever and the promotion boasted a record number of contest entries. The message got nearly 15,000 retweets and more than 20,000 likes on Facebook. Aha Moment: The biggest moment of Super Bowl XLVII? The blackout! A power outage at the Superdome caused the lights to go out for an agonizing 34 minutes. 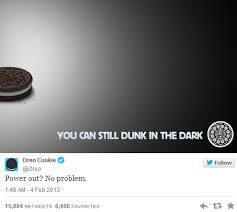 The social media team for the cookie brand quickly came up with an instant way to use the situation to the companies’ advantage. 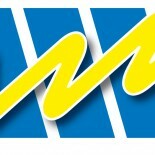 They tweeted out an ad that read “Power Out? No Problem” with a starkly-lit image of a solitary Oreo and the caption, “You can still dunk in the dark.” While the Baltimore Ravens may have come out ahead in the game, many cookie lovers declared, “Oreo won the Super Bowl blackout.” And here’s how they did it: http://www.youtube.com/watch?v=jw9RSXaTFhA So what about you? 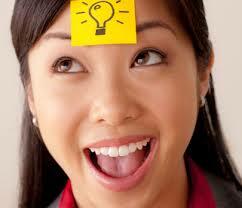 We want to learn about your favorite “Aha Moments” in the comments section below. This entry was posted on March 25, 2015 by Kim Haman in Consumerism and tagged Advertising, Aha Moments!, Brand equity, Brand loyalty, Brand passion, Brand powerhouse, Branding, business, Marketing.